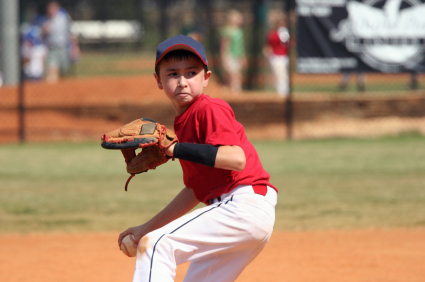 Little Leaguer’s elbow refers more to a collection of injuries to the elbow in young throwing athletes rather than one specific injury. When a sports medicine physician uses the term “Little Leaguer’s elbow” or “Little Leaguer’s shoulder”, he or she is usually referring to overuse issues with growing athletes. Among the specific injuries that can occur with “Little Leaguer’s elbow” are inflammation or irritation of the growth plate on the inside of the elbow, fractures through the growth plate on the inside of the elbow, compression injuries to the bone and cartilage on the outside of the elbow, and many others. The elbow is subjected to tremendous forces while throwing, especially with pitching. The force that overtime can do the most damage to the elbow is what we call valgus force. This is the force on the elbow where the hand is pulled away from the body. The valgus force puts a tension stress on the inside of the elbow. It exerts a compression force on the outside of the elbow. Finally, there is a sheer force across the back of the elbow. The concern with valgus forces across the elbow is not so much with any one pitch as it is with continued pitching over weeks, months, and years. As I said, these are typically overuse injuries where the minor stresses build up over time to cause larger injuries. In my opinion, the first thing to emphasize when the young throwing athlete complains of elbow pain is to take it seriously. By that I mean that the coach, the parents, the athlete, and even the physician should take the pain very seriously. Young athletes do not usually want to see a doctor, so any complaints of pain should be investigated. I don’t always think that a period of rest, anywhere from 2 to 3 days to several weeks, is a bad idea, especially if the pain has been going on for several weeks or even months. Next I think it’s important to look at the throwing history of the child to monitor for signs of overuse. I often ask the child and the parents about his volume of pitching. I like to know if the child is pitching for one team or multiple teams during the same season. I want to know if the child pitches throughout the year or takes several months per year off from throwing sports. I ask how many times per week the child pitches and try to get a sense of how many pitches he throws in a given week, month, and season. I want to know what pitches the child throws. All of these questions help me determine if the child is at risk for an overuse elbow injury. Tips to prevent injuries in youth sports. Young pitchers with shoulder or elbow pain should see a doctor to ensure it’s not serious. Fortunately most overuse injuries to the elbow in young throwing athletes are preventable. I think it’s critical that we educate athletes, but also the parents and coaches, to recognize signs of an overuse injury and the means to prevent them. Pitch count rules have been adopted throughout Little League baseball, and these counts should be followed. Not only should the child not exceed pitch count totals for games, weeks, and seasons, but also he should take the necessary days of rest that these rules emphasize. Also, young pitchers should never pitch for more than one team each season. I think it’s very important that children also take at least three months of the year off from a throwing sport. This time off does not necessarily mean he cannot play sports at all. I think that he should play a sport that stresses other parts the body to give the shoulder and elbow time to rest and minimize cumulative damage to these joints. Coaches and parents need to focus less on winning or trying to produce an elite pitcher at a young age and instead focus on proper pitching mechanics and overall enjoyment of the game. With proper education, rest, and attention to signs of a problem, we can all significantly decrease the number of overuse elbow injuries in the sports.